Street Fighter V (game, 2016). A fighting video game by Capcom. Developed by Capcom, Dimps. Official Trailer. Street Fighter V is a fighting video game by Capcom, developed by Capcom and Dimps. 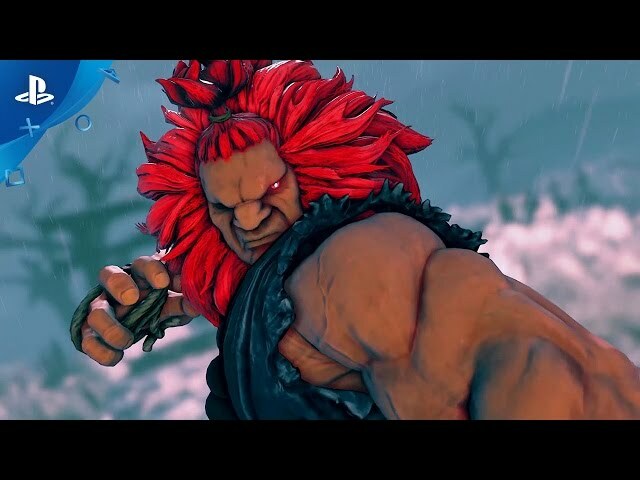 Street Fighter V - PlayStation Experience 2016: Akuma Trailer | PS4. The story takes place between the events of Street Fighter IV and Street Fighter III. Years after he sacrificed himself to stop M. Bison, Charlie Nash awakens in a tomb and is instructed by a young woman named Helen to retrieve an item from his old friend Guile that will help him destroy Bison. Meanwhile, the Shadaloo organization initiates "Operation C.H.A.I.N.S." by launching seven artificial satellites in orbit known as the "Black Moons", planning to spread fear and despair, the source of Bison's Psycho Power, and siphon this energy in order to render him and his forces invincible. Rashid infiltrates the headquarters of Shadaloo looking for a friend who was kidnapped by them, but is discovered and defeated by F.A.N.G. F.A.N.G. steals a chess piece-like item in Rashid's possession and uses it to detonate one of the Black Moons, triggering a high altitude electromagnetic pulse above New York City. Unsuccessfully attempting to stop Bison and his subordinates in New York, Guile and Chun-Li are attacked by Charlie, who attempts to take the pieces sent to them before fleeing. Charlie reunites with Helen, who also convinces Rashid and Juri to form an alliance with them to retrieve the pieces. She explains they are the keys to control the Black Moons, which were sent to certain individuals in order to prevent their use. In possession of the same information, Karin Kanzuki summons warriors from around the globe to help gather the pieces before Shadaloo as well. All of them answer Karin's call except Ryu, who stays behind at Ken's suggestion to train further in order to keep his Satsui no Hadou at bay. 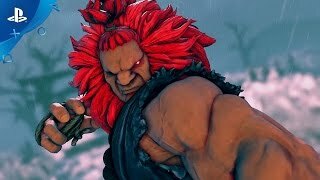 Street Fighter V carries on the 2D fighting gameplay of its predecessors, in which two fighters use a variety of attacks and special abilities to knock out their opponent. The game features the EX gauge introduced in Street Fighter III, which builds as the player lands attacks and can be used to either power up special moves or perform super combos known as Critical Arts, although the Focus Attacks from the previous game have been removed. New to this game is the "V-Gauge", which builds as the player receives attacks and adds three new techniques: V-Skills, V-Reversals, and V-Triggers. V-Skills are special attacks unique to each fighter; for example, Ryu can parry an attack while M. Bison can reflect projectiles, some of which build V-Gauge when successfully performed. V-Reversals allow players to use a section of the V-Gauge to perform a counter move whilst being attacked. Finally, V-Triggers use the entire V-Gauge to allow the player to perform a unique ability, such as a temporary damage boost for Ryu's energy balls or added hits to Chun-Li's attacks. Additionally, the Stun Meter, which has been present since Street Fighter III, is made visible under the health bars in this game. The Stun Meter increases when receiving consecutive attacks and will cause the player to become stunned if filled; thus, it encourages players to play offensively when the opponent's Meter is close to full. The game also features an interactive arena, showcasing special animations when a player is defeated at the edge of the arena. Street Fighter V was scheduled to be released by Capcom on February 15, 2016, on February 16, 2016, on January 16, 2018 and in 2019.